A plastic material is any of a wide range of synthetic or semi-synthetic organic solids used in the manufacture of industrial products. Plastics are typically polymers of high molecular mass, and may contain other substances to improve performance and/or reduce production costs. Monomers of plastic are either natural or synthetic organic compounds. The word plastic is derived from the Greek πλαστικός (plastikos) meaning capable of being shaped or molded, from πλαστός (plastos) meaning molded. It refers to their malleability, or plasticity during manufacture, that allows them to be cast, pressed, or extruded into a variety of shapes—such as films, fibers, plates, tubes, bottles, boxes, and much more. There are two types of plastics: thermoplastics and thermosetting polymers. Thermoplastics are the plastics that do not undergo chemical change in their composition when heated and can be moulded again and again; examples are polyethylene, polypropylene, polystyrene, polyvinyl chloride and polytetrafluoroethylene (PTFE). Thermosets can melt and take shape once; after they have solidified, they stay solid. The use of plastics is constrained chiefly by their organic chemistry, which seriously limits their properties, such as hardness, density,heat resistance, organic solvents, oxidation, and ionizing radiation. In particular, most plastics will melt or decompose when heated to a few hundred degrees celsius. While plastics can be made electrically conductive, with the conductivity of up to 80 kS/cm in stretch-oriented polyacetylene, they are still no match for most metals like copper which have conductivities of several hundreds kS/cm. Plastics are still too expensive to replace wood, concrete and ceramic in bulky items like ordinary buildings, bridges, dams, pavement, and railroad ties. Common thermoplastics range from 20,000 to 500,000 amu, while thermosets are assumed to have infinite molecular weight. These chains are made up of many repeating molecular units, known as repeat units, derived from monomers; each polymer chain will have several thousand repeating units. The vast majority of plastics are composed of polymers of carbon and hydrogen alone or with oxygen, nitrogen, chlorine or sulfur in the backbone. (Some of commercial interests are silicon based.) The backbone is that part of the chain on the main "path" linking a large number of repeat units together. To customize the properties of a plastic, different molecular groups "hang" from the backbone (usually they are "hung" as part of the monomers before linking monomers together to form the polymer chain). This fine tuning of the properties of the polymer by repeating unit's molecular structure has allowed plastics to become an indispensable part of twenty first-century world. The first human-made plastic was invented by Alexander Parkes in 1855; he called this plastic Parkesine (later called celluloid). It was unveiled at the 1862 Great International Exhibition in London. The development of plastics has come from the use of natural plastic materials (e.g., chewing gum, shellac) to the use of chemically modified natural materials (e.g., rubber, nitrocellulose, collagen, galalite) and finally to completely synthetic molecules (e.g., bakelite, epoxy, polyvinyl chloride, polyethylene). In 1866, Parkes formed the Parkesine Company to mass produce the material. The company, however, failed due to poor product quality as Parkes tried to reduce costs. Parkesine's successors were Xylonite, produced by Daniel Spill (an associate of Parkes), and Celluloid from John Wesley Hyatt. Parkesine was made from cellulose treated with nitric acid and a solvent. The generic name of Parkesine is pyroxylin, or Celluloid. Parkesine is often synthetic ivory. The Parkesine company ceased trading in 1868. Pictures of Parkesine are held by the Plastics Historical Society of London. There is a plaque on the wall of the site of the Parkesine Works. The first so called plastic based on a synthetic polymer was made from phenol and formaldehyde, with the first viable and cheap synthesis methods invented in 1907, by Leo Hendrik Baekeland, a Belgian-born American living in New York state. Baekeland was looking for an insulating shellac to coat wires in electric motors and generators. He found that mixtures of phenol (C6H5OH) and formaldehyde (HCOH) formed a sticky mass when mixed together and heated, and the mass became extremely hard if allowed to cool. He continued his investigations and found that the material could be mixed with wood flour, asbestos, or slate dust to create "composite" materials with different properties. Most of these compositions were strong and fire resistant. The only problem was that the material tended to foam during synthesis, and the resulting product was of unacceptable quality. Bakelite was cheap, strong, and durable. It was molded into thousands of forms, such as cases for radios, telephones and clocks, and billiard balls. Phenol-based ("Phenolic") plastics have been largely replaced by cheaper and less brittle plastics, but they are still used in applications requiring their insulating and heat-resistant properties. For example, some electronic circuit boards are made of sheets of paper or cloth impregnated with phenolic resin. 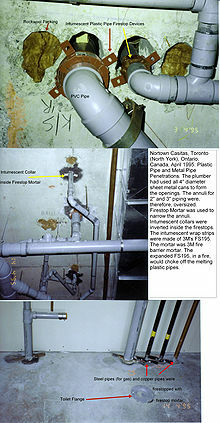 Plastic piping and firestops being installed in Ontario. Certain plastic pipes can be used in some non-combustible buildings, provided they are firestopped properly and that the flame spread ratings comply with the local building code. After the First World War, improvements in chemical technology led to an explosion in new forms of plastics. Among the earliest examples in the wave of new plastics were polystyrene (PS) and polyvinyl chloride (PVC). Polyvinyl Chloride (PVC, commonly called "vinyl") has side chains incorporating chlorine atoms, which form strong bonds. PVC in its normal form is stiff, strong, heat and weather resistant, and is now used for making plumbing, gutters, house siding, enclosures for computers and other electronics gear. PVC can also be softened with chemical processing, and in this form it is now used for shrink-wrap, food packaging, and rain gear. Subsequently polyamides 6, 10, 11, and 12 have been developed based on monomers which are ring compounds; e.g. caprolactam. Nylon 66 is a material manufactured by condensation polymerization. Parkes developed a synthetic replacement for ivory which he marketed under the trade name Parkesine, and which won a bronze medal at the 1862 World's fair in London. Parkesine was made from cellulose (the major component of plant cell walls) treated with nitric acid as a solvent. The output of the process (commonly known as cellulose nitrate or pyroxilin) could be dissolved in alcohol and hardened into a transparent and elastic material that could be molded when heated. By incorporating pigments into the product, it could be made to resemble ivory. 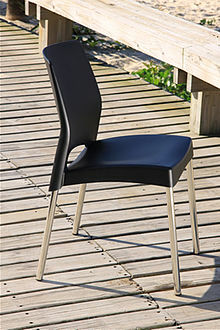 Bois Durci is a plastic molding material based on cellulose. It was patented in Paris by Lepage in 1855. It is made from finely ground wood flour mixed with a binder, either egg or blood albumen, or gelatine. The wood is probably either ebony or rose wood, which gives a black or brown resin. The mixture is dried and ground into a fine powder. The powder is placed in a steel mold and compressed in a powerful hydraulic press while being heated by steam. The final product has a highly polished finish imparted by the surface of the steel mold. Pea starch film with trigger biodegradation properties for agricultural applications (TRIGGER). Because of the fragmentation in the market and ambiguous definitions it is difficult to describe the total market size for bioplastics, but estimates put global production capacity at 327,000 tonnes. In contrast, global consumption of all flexible packaging is estimated at around 12.3 million tonnes. Due to their insolubility in water and relative chemical inertness, pure plastics generally have low toxicity in their finished state, and will pass through the digestive system with no ill effect (other than mechanical damage or obstruction). However, plastics often contain a variety of toxic additives. For example, plasticizers like adipates and phthalates are often added to brittle plastics like polyvinyl chloride (PVC) to make them pliable enough for use in food packaging, toys and teethers, tubing, shower curtains and other items. Traces of these chemicals can leach out of the plastic when it comes into contact with food. Out of these concerns, the European Union has banned the use of DEHP (di-2-ethylhexyl phthalate), the most widely used plasticizer in PVC. Some compounds leaching from polystyrene food containers have been found to interfere with hormone functions and are suspected human carcinogens. Moreover, while the finished plastic may be non-toxic, the monomers used in its manufacture may be toxic; and small amounts of those chemicals may remain trapped in the product. The World Health Organization's International Agency for Research on Cancer (IARC) has recognized the chemical used to make PVC, vinyl chloride, as a known human carcinogen. Some polymers may also decompose into the monomers or other toxic substances when heated. In 2011, it was reported that "almost all plastic products" sampled released chemicals with estrogenic activity, although the researchers identified plastics which did not leach chemicals with estrogenic activity. Plastics are durable and degrade very slowly; the molecular bonds that make plastic so durable make it equally resistant to natural processes of degradation. Since the 1950s, one billion tons of plastic have been discarded and may persist for hundreds or even thousands of years. In some cases, burning plastic can release toxic fumes. Burning the plastic polyvinyl chloride (PVC) may create dioxin. Also, the manufacturing of plastics often creates large quantities of chemical pollutants. Plastic can be converted as a fuel. Plastic is made from crude oil, so it can be broken down to liquid hydrocarbon. One kilogram of waste plastic produces a liter of hydrocarbon. Plastic wastes are used in cement plants as a fuel. Unfortunately, recycling of plastics has proven to be a difficult process. The biggest problem is that it is difficult to automate the sorting of plastic wastes, making it labor intensive. Typically, workers sort the plastic by looking at the resin identification code, although common containers like soda bottles can be sorted from memory. Typically, the caps for PETE bottles are made from a different kind of plastic which is not recyclable, which presents additional problems to the automated sorting process. Other recyclable materials such as metals are easier to process mechanically. However, new processes of mechanical sorting are being developed to increase capacity and efficiency of plastic recycling. While containers are usually made from a single type and color of plastic, making them relatively easy to be sorted, a consumer product like a cellular phone may have many small parts consisting of over a dozen different types and colors of plastics. In such cases, the resources it would take to separate the plastics far exceed their value and the item is discarded. However, developments are taking place in the field of active disassembly, which may result in more consumer product components being re-used or recycled. Recycling certain types of plastics can be unprofitable, as well. For example, polystyrene is rarely recycled because it is usually not cost effective. These unrecycled wastes are typically disposed of in landfills, incinerated or used to produce electricity at waste-to-energy plants. Polyester (PES) - Fibers, textiles. Polyethylene terephthalate (PET) - Carbonated drinks bottles, peanut butter jars, plastic film, microwavable packaging. Polyethylene (PE) - Wide range of inexpensive uses including supermarket bags, plastic bottles. High-density polyethylene - Detergent bottles and milk jugs. Polyvinyl chloride (PVC) - Plumbing pipes and guttering, shower curtains, window frames, flooring. Polyvinylidene chloride (PVDC) (Saran) - Food packaging. Low-density polyethylene (LDPE) - Outdoor furniture, siding, floor tiles, shower curtains, clamshell packaging. 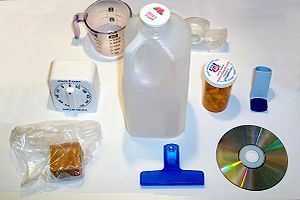 Polypropylene (PP) - Bottle caps, drinking straws, yogurt containers, appliances, car fenders (bumpers), plastic pressure pipe systems. Polystyrene (PS) - Packaging foam/"peanuts", food containers, plastic tableware, disposable cups, plates, cutlery, CD and cassette boxes. Polyamides (PA) (Nylons) - Fibers, toothbrush bristles, fishing line, under-the-hood car engine moldings. Acrylonitrile butadiene styrene (ABS) - Electronic equipment cases (e.g., computer monitors, printers, keyboards), drainage pipe. Polycarbonate (PC) - Compact discs, eyeglasses, riot shields, security windows, traffic lights, lenses. Polycarbonate/Acrylonitrile Butadiene Styrene (PC/ABS) - A blend of PC and ABS that creates a stronger plastic. Used in car interior and exterior parts, and mobile phone bodies. Polyurethanes (PU) - Cushioning foams, thermal insulation foams, surface coatings, printing rollers (Currently 6th or 7th most commonly used plastic material, for instance the most commonly used plastic found in cars). Melamine formaldehyde (MF) - One of the aminoplasts, and used as a multi-colorable alternative to phenolics, for instance in moldings (e.g., break-resistance alternatives to ceramic cups, plates and bowls for children) and the decorated top surface layer of the paper laminates (e.g., Formica). Plastarch material - Biodegradable and heat resistant, thermoplastic composed of modified corn starch. Phenolics (PF) or (phenol formaldehydes) - High modulus, relatively heat resistant, and excellent fire resistant polymer. Used for insulating parts in electrical fixtures, paper laminated products (e.g., Formica), thermally insulation foams. It is a thermosetting plastic, with the familiar trade name Bakelite, that can be molded by heat and pressure when mixed with a filler-like wood flour or can be cast in its unfilled liquid form or cast as foam (e.g., Oasis). Problems include the probability of moldings naturally being dark colors (red, green, brown), and as thermoset it is difficult to recycle. Polyetheretherketone (PEEK) - Strong, chemical- and heat-resistant thermoplastic, biocompatibility allows for use in medical implant applications, aerospace moldings. One of the most expensive commercial polymers. Polyetherimide (PEI) (Ultem) - A high temperature, chemically stable polymer that does not crystallize. Polylactic acid (PLA) - A biodegradable, thermoplastic found converted into a variety of aliphatic polyesters derived from lactic acid which in turn can be made by fermentation of various agricultural products such as corn starch, once made from dairy products. Polymethyl methacrylate (PMMA) - Contact lenses, glazing (best known in this form by its various trade names around the world; e.g., Perspex, Oroglas, Plexiglas), aglets, fluorescent light diffusers, rear light covers for vehicles. It forms the basis of artistic and commercial acrylic paints when suspended in water with the use of other agents. Polytetrafluoroethylene (PTFE) - Heat-resistant, low-friction coatings, used in things like non-stick surfaces for frying pans, plumber's tape and water slides. It is more commonly known as Teflon. Urea-formaldehyde (UF) - One of the aminoplasts and used as a multi-colorable alternative to phenolics. Used as a wood adhesive (for plywood, chipboard, hardboard) and electrical switch housings. ^ Heeger, A. J.; Schrieffer, J. R.; Su, W. -P.; Su, W. (1988). "Solitons in conducting polymers". Reviews of Modern Physics 60: 781. Bibcode 1988RvMP...60..781H. doi:10.1103/RevModPhys.60.781. ^ Burroughes, J. H.; Bradley, D. D. C.; Brown, A. R.; Marks, R. N.; MacKay, K.; Friend, R. H.; Burns, P. L.; Holmes, A. B. (1990). "Light-emitting diodes based on conjugated polymers". Nature 347: 539. doi:10.1038/347539a0. ^ Sariciftci, N. S.; Smilowitz, L.; Heeger, A. J.; Wudl, F. (1992). "Photoinduced Electron Transfer from a Conducting Polymer to Buckminsterfullerene". Science 258 (5087): 1474. doi:10.1126/science.258.5087.1474. PMID 17755110. ^ Sirringhaus, H. (2005). "Device Physics of Solution-Processed Organic Field-Effect Transistors". Advanced Materials 17: 2411. doi:10.1002/adma.200501152. ^ Jezek, Geno. "What is Vinyl?". http://www.whatisvinyl.com/. Retrieved January 2011. ^ "Polyvinyl chloride". Plasticsusa.com. http://www.plasticsusa.com/pvc.html. Retrieved January 2011. ^ "Technical Support Document: Toxicology of Hydrogen Chloride" (PDF). California EPA, Office of Environmental Health Hazard Assessment. Revised 4 February 2004. p. 8. http://oehha.ca.gov/public_info/pdf/TSDHydrogenChlorideMethLabs0204.pdf. Retrieved January 2011. ^ "How can I preserve my family photographs for my grandchildren?". The Library of Congress Preservation FAQs. LoC. http://www.loc.gov/preserv/presfaq.html#5. Retrieved January 2011. ^ Kinnane, Adrian (2002). DuPont: From the banks of the Brandywine to miracles of science. Baltimore, Md. : Johns Hopkins University Press. pp. 116–125. ISBN 0-8018-7059-3. ^ a b c McRandle, P.W. (March/April 2004). "Plastic Water Bottles". National Geographic. 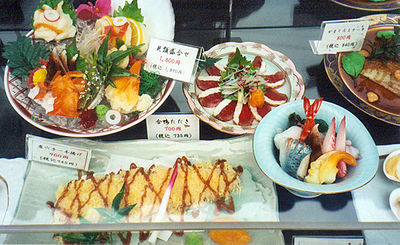 http://www.thegreenguide.com/doc/101/plastic. Retrieved 2007-11-13. ^ Chun Z. Yang, Stuart I. Yaniger, V Craig. Jordan, Daniel J. Klein, George D. Bittner. Most Plastic Products Release Estrogenic Chemicals: A Potential Health Problem That Can Be Solved. Environmental Health Perspectives. ^ Alonso-Magdalena, Paloma; Morimoto, Sumiko; Ripoll, Cristina; Fuentes, Esther; Nadal, Angel (January 2006). "The Estrogenic Effect of Bisphenol A Disrupts Pancreatic β-Cell Function In Vivo and Induces Insulin Resistance". Environmental Health Perspectives 114 (1): 106–112. doi:10.1289/ehp.8451. PMC 1332664. PMID 16393666. http://www.ehponline.org/docs/2005/8451/abstract.html. .
^ Alan Weisman, "The World Without Us," St. Martin's Press, NY, 2007. ^ "Dioxins". Oregon Environmental Council. http://www.oeconline.org/our-work/kidshealth/toxics/air/dioxins. Substantial parts of this text originated from An Introduction To Plastics v1.0 / 1 March 2001 / greg goebel / public domain. This page was last modified on 5 May 2011 at 13:16.